The students learn from the greatest Tamil works instead: from Thiruvalluvar’s Thirukkural, a classic Tamil text comprising thousands of couplets, Subramania Bharati’s poems and lines from Sangam literature. Three times a week, Zhou teaches them Tamil texts. The 2011 Tamil film 7aum Arivu came in handy when Zhou Xin, 33, taught her students how to describe beauty in the Tamil language. A picture popped up on the screen, of Tamil actor Surya who plays Bodhidharma — a master of martial arts and medical remedies — who is sent to China to stop the spread of a pandemic disease. “The film was not that China-friendly,” laughs Zhou, about a plot that revolves around a biological war against India. “All our language teaching is integrated with culture teaching. 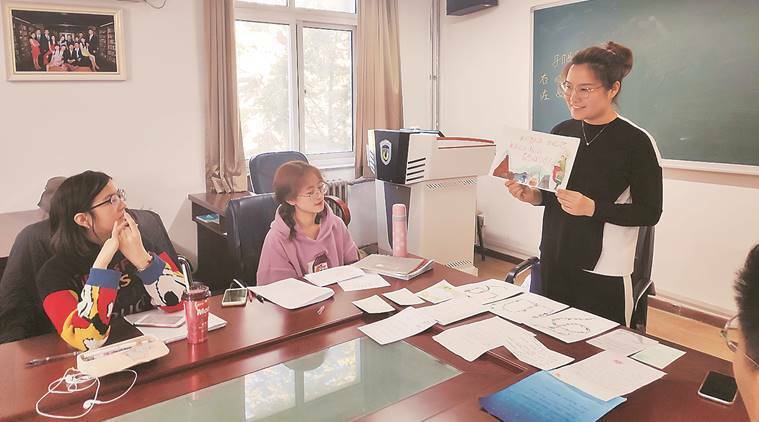 If I teach them about beauty, I won’t pick a random picture but I will pick one of Surya or Rajinikanth and talk to them about the films they were in,” says Zhou, known by her Tamil name Eswari, when she is teaching at the Beijing Foreign Studies University (BFSU). Learning about Tamil culture, or more broadly about India, is reserved for an hour on Wednesday afternoons. For instance, last week the students watched the Oscar-winning documentary Period. End of Sentence. For the rest of the 11 hours each week, it is a challenging task to get ten enthusiastic 18-year-olds to twist their tongues in ways that will produce uniquely Tamil syllables. The course is only six-months old and compared to Mandarin, the words are long. “One page of Chinese is almost two pages in Tamil!” says Zhou, and all of her students find Tamil numbers particularly difficult. During the listening segment last week, to test them on numbers, Suresh asked Jayanthi if she wanted to watch a film and which time she preferred. Zhou played Jayanthi, her colleague V Kalathi, a native Tamil speaker from Kancheepuram in Tamil Nadu, played Suresh. “I write and record the audio and Kalathi helps me correct it,” she says. Since there is a dearth of material on Tamil in China, including in the National Library, Zhou seeks out material from off the internet. “The textbooks for native speakers may not be culturally very suitable since they start from the very basics — Amma, Appa — which my students will never really use here,” she says. She still relies on a few conversational Tamil books. The students learn from the greatest Tamil works instead: from Thiruvalluvar’s Thirukkural, a classic Tamil text comprising thousands of couplets, Subramania Bharati’s poems and lines from Sangam literature. Three times a week, Zhou teaches them Tamil texts. Kalathi complements this with spoken Tamil on alternative days. While Zhou, who previously worked as an announcer and translator for the Tamil section of China Radio International (CRI), travelled to India to learn Tamil for seven months in Puducherry, her colleague Kalathi, after an MPhil and PhD in Delhi’s Jawaharlal Nehru University, travelled to Beijing to learn Chinese. “My JNU adviser, after asking me which place I came from, got me to see connections between Kancheepuram and China through the works of Buddhist monk Hiuen-Tsang. So I started getting interested in comparing the two languages,” says Kalathi. The idea to start a Tamil course in BFLU is 4-5 years old, but there was no faculty. “I came back from the UK in 2017 after completing my Master’s and we had the idea that why not establish this department. Things finally took off six months ago,” says Zhou. BFSU’s interest is not only in Tamil. There is a Hindi language course that has run for over ten years, Bengali recently started, and Punjabi will be introduced this year. “The interest is in pushing for all area studies, like African and South Asian languages. Even three years ago, we didn’t have that many languages here, so they wanted to start as many languages as possible,” she says.